Parts of the Earth’s mantle might be loaded with diamonds, if a new model turns out to be correct. But no, you can’t mine them—they’d be almost a hundred miles below the surface. Scientists’ models show that sound waves seem to travel too quickly through the old, stable cores of continents, called “cratons,” which extend deep into the mantle at depths around 120 to 150 kilometers (75 to 93 miles). Through observations, experiments, and modeling, one team figured that a potential way to explain the sound speed anomaly would be the presence of a lot of diamonds, a medium that allows for a faster speed of sound than other crystals. 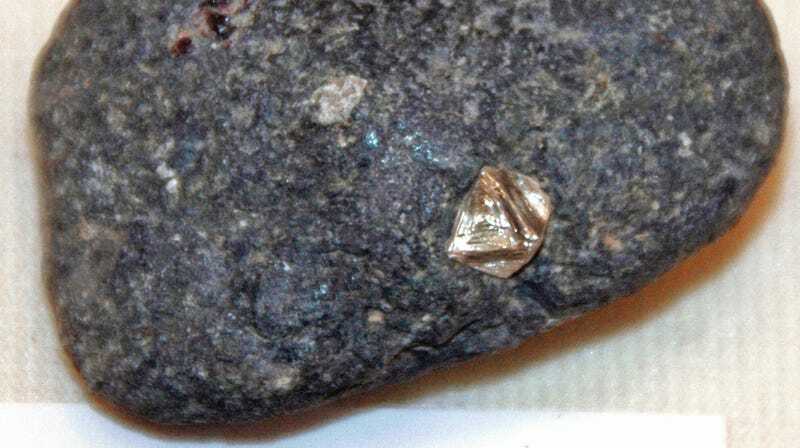 Perhaps the Earth is as much as 2 percent diamonds by volume, they found. Scientists have modeled the rock beneath continents through tomography, which you can think of as like an x-ray image, but using sound waves. But sound-wave velocities of around 4.7 kilometers per second (about 10,513 mph) are faster than sound-wave velocities in other kinds of minerals beneath the crust, according to the paper in the journal Geochemistry, Geophysics, Geosystems. The researchers realized that if the regions had either 3 percent diamonds by volume or 50 percent of a rock formed at high pressure and temperature called eclogite, it would enable the sound speeds they observed. But both of those numbers seemed too high, based on observations of the minerals that end up on the Earth’s surface: diamond-containing rocks called kimberlites. The researchers compromised and figured that 20 percent eclogite and 2 percent diamonds could explain the high velocities. The diamonds could be sprinkled as crystals found uniformly throughout the cratons. Saying that 2 percent of these cratons is diamond is a little controversial, of course, and would change much of what scientists understand about the Earth. These cratons form some of the oldest rocks on the Earth, and their study could reveal something about how the continents move around. But there’s much more work to do. “Now we need to do more checking to see if there’s something we overlooked or some better measurements,” said Faul. Correction: This post previously called eclogite a mineral. It’s actually a rock. Sorry about that!